There is a longstanding joke among veterinarians: “Dog parks keep us in business.” Why is that the case? Dog parks are rife with well-intentioned owners and misbehaved dogs, resulting in dog fights and dog bites. 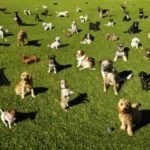 Dog parks may seem like a good idea: a way to exercise Fido, a way to socialize him, a way to meet fellow-dog lovers and fawn over cute puppies. If every dog was perfectly socialized, friendly, fearless, free of anxiety and not possessive, then yes, dog parks could be a utopia. The reality is that many dogs with mild to major behavioral problems are taken to dog parks on a regular basis. The environment in a dog park (new dogs, new people, new smells) can challenge the fortitude of even the most docile and gentle pup. Even seemingly well-behaved, calm dogs can be overwhelmed and anxious when thrust into an environment where packs of dogs are running off-leash. 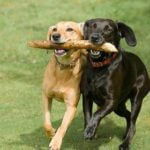 Many well-meaning dog owners think that they can cure Fido of his fearfulness by taking him to the dog park. This is simply not the case, and may actually exacerbate Fido’s fear. Dogs that are anxious and/or fearful do not respond well when forced to confront uncomfortable situations. Instead of “desensitizing” your pup, taking a timid, fearful dog to the park may worsen his behavior and reinforce his fear. The same applies for dogs that have “possession aggression“, where they become possessive of coveted items such as balls, toys or sticks. Possession aggression is a common trigger for inter-dog aggression. Dogs that exhibit aggressive behaviors when guarding resources such as toys are not candidates for the dog park. The reality is that the dog park is not for every dog. In my experience, it’s really not for many dogs. There are better, safer and more predictable ways to exercise Fido. Ask your veterinary staff at Newtown Square Veterinary Hospital for advice on whether the dog park is a good choice for your pup, or what alternative exercise options may be a better choice.